In the last 45 years, South African roller hockey...from history to historical! South African Roller Hockey on the Web! For the first time in its 45 year history, South Africa has earned the right to be amongst the best! in the 37th, South Africa booked their place amongst the best in the world. Tonight, South Africa plays the U.S.A for Champion and Second Place positions. to Pretoria where at ACPP there will be a lunch in their honor. SOUTH AFRICA FACE HOSTS AUSTRIA IN THE SEMI FINAL! ARGENTINA ARE THE WORLD CHAMPIONS FOR THE 4TH TIME! South Africa off to a bad start...and finish! Certament una experiència única per als que els agraïm a tots els que van facilitar la participació dels equips d'Àfrica del Sud en la recent Copa Amèrica. Un agraïment molt especial a Ramon Basiano, president de la Federació Catalana de Patinatge i els seus executius i com la Confederació de Patí Sudamericana i tècnics, Jordi Camps e Josep Barberà. Individuals i organitzacions que ens va donar l'oportunitat d'aconseguir dins d'una família molt especial, la família dels patins de hoquei. Hem tingut l'oportunitat d'apreciar com un torneig ha de ser organitzada i es practica en una sala d'ultra-modern i la vida amb el estimat més practicants d'aquest esport. Tornem més enriquit tant esportives i intel.lectuals. Se'ns ha obert un món de l'esport ideal en tots els nivells. També podríem no oblidi donar les gràcies a l'organització gestionada per professionals d'Alfred Verdaguer, President del Comitè Organitzador de la Copa Amèrica, l'Alvaro Triana Ricci, incansable per ajudar-nos a localitzar l'equipatge de determinats esportists, el Club Pati Vic que va posar les seves installacions a la nostra disposició, l'Alberg Canonge Collell, "casa nostra" durant vuit dies, Irene i Lucía, dos joves traductors agradables sempre disposat a ajudar-nos i per què no, la ciutat de Vic. Certament, aquest text conté errors i no seran aquells que no entenem, però per a aquells als quals es destina, estem segurs que ens perdonarà. will officially start on Friday the 30th of October at APF. As one door closes, another one opens! project which is very dear to the community. registerd to compete in all tournaments. 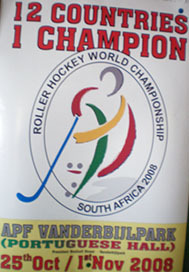 South African Roller Hockey on Video. Follow the cameraman to the Videos page. South African Senior National Team climbs 3 places on the World Rankings. The CIRH - Comite Internationale de Rink-Hockey (World Governing Body) offered South Africa the opportunity to host the first ever World Cup in Africa. It has placed the responsibility on us to lead in the Continent in terms of developing and standardizing the sport. With the advent of the African Confederation, we will be hosting the African Nations Cup as well as Club Championships. We have also secured co-operative alliances in Africa as well as in South America and Europe. The international hockey community has recognized our efforts and reciprocated with assistance such as exposure (susidized), equipment, coaching programs, etc.